The new Education Pavilion is located just east of the Visitor Center in the open area adjacent to the parking area. The purpose of the building is to give visiting school groups and the Junior Rangers a place to meet in an area of the Park more immediate to subjects they may be exploring. The pavilion also provides a place for the many events we hold in the Park as well as being a working area for other interpretive and nature oriented groups. The structure has power sources usable for microscopes, projectors and lighting. It will even shelter groups from the rain when necessary. New equipment has been added to the pavilion to make it an outdoor classroom. So far there are portable tables and chairs to make seating comfortable. There are new microscopes and binoculars to make discovery more interesting. There is also a cart that will make it easier to haul equipment in and out of the new storage room. We have provided a flatscreen TV system that will allow for campfire program slide shows and other educational presentations. 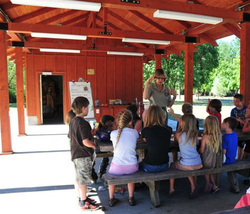 Jr. Ranger programs, school programs, and evening programs will be much enhanced by all aspects of this new structure. There will be multiple uses of this building for many future generations to come, thanks to the hard work and support of CLSPIA.